Two years after this initial contact, in August 2017, the PCCP team introduced CANMARFOA to the Cantilan Bank, a microfinance institution that offers agri-value chain loans. “It was through the recommendation of Winrock International – PCCP that we were able to avail the services of Cantilan Bank,” said Mr. Azarcon when asked how it all started. 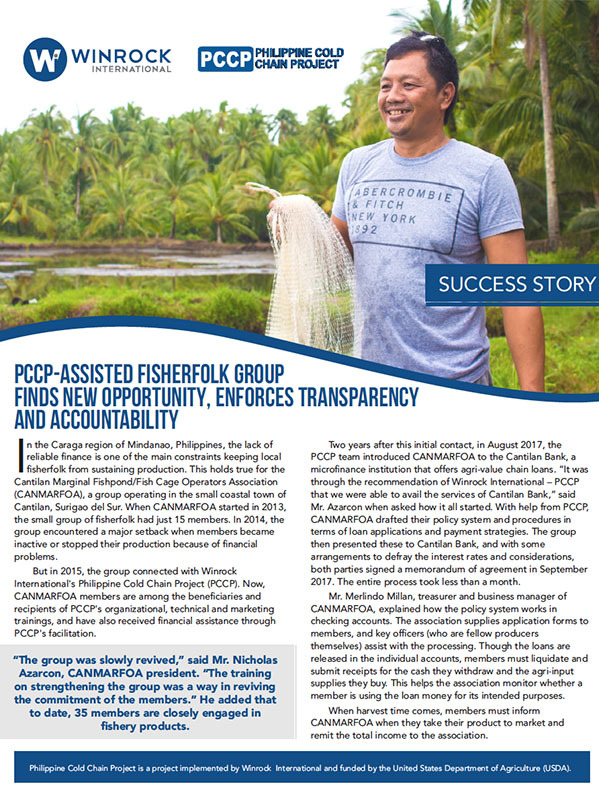 With help from PCCP, CANMARFOA drafted their policy system and procedures in terms of loan applications and payment strategies. The group then presented these to Cantilan Bank, and with some arrangements to defray the interest rates and considerations, both parties signed a memorandum of agreement in September 2017. The entire process took less than a month.